Download Free Cowbell/Cowbellpedia Mathematics Junior and Senior Past Questions and Answers in PDF From 2009, 2010, 2011, 2012, 2013, 2014, 2015, 2016, 2017, 2018, 2019, 2020. 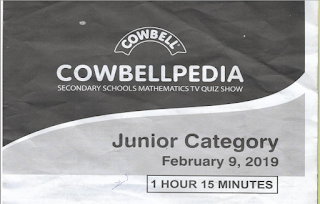 Cowbellpedia TV, Download Past Questions; Practice Online , Attempt Cowbell Mathematics Competition Past Questions Online. This is to inform all Principals, Proprietress, Teachers, Parents who enrolled their wards/candidates for the Cowbell Cowbellpedia Junior or Senior Secondary School Mathematics Examinations that they can now get/download the previous examination past questions online. This will help or serve as a learning guide to them or be used to coach or brush them up, also enlighten them or create awareness of the type of questions they will be expecting during the written examinations. We are glad that the past questions are made available for public download by one of our teachers, you can follow the links below to download from year 2009 - 2019. NOTE: The Cowbellpedia Registration for 2019/2020 Edition has already CLOSED, kindly follow the link below to be updated when registration begins for next edition. AVOID USING OPERA MINI BROWSER ON PHONE TO ACCESS THE LINKS BELOW. USE ONLY CHROME, FIREFOX, UCB-BROWSER, CM BROWSER E.TC. Thanks for the delivery after payment, gonna recommend others to you guys!!! Call MR CHINEKS on 08107431933, Currently we dont have MAN Olympiad Past Questions. This is crazy. If you aren't giving free questions why tag it free. Sorry, its seems crazy to you but we gave out 20 questions free for each year we uploaded... wasnt that enough? to get the full questions and answers requires a fee. Thank You!!! Contains 40 Objectives Questions and Five Theory. Can I still register for the examination please? Nope, till next year registration begins. can someone who registered for this year cowbellpedia register for next year?